The piezo-electric scaler is a staple in our hygiene rooms. Hygienists in our office rave about our new piezo-electric scalers and, more importantly, patients are very complimentary about how their mouths feel after their maintenance visits. If you have the desire to move into the world of electric scalers, or are ready to upgrade, give considerable thought to the purchase of a piezo-electric scaler. This technology will stand the test of time. It is the ultimate in dental ultrasonic scalers. (1) versatile ultrasonic units have numerous clinical applications due to a comprehensive range of accessories; in addition to inserts for use in scaling and debridement, many other inserts are available for procedures such as periodontics, apical surgery, and prosthodontics; dozens of various inserts are offered that all fit on the same handpiece. (2) less water is necessary during the procedure, adding to patient comfort and operator convenience; less need for management of excessive water accumulation; less water is required because the unit’s efficiency is greater than 90%—there is no delivered energy or mechanical friction, hence, little secondary temperature rise; since there is very little temperature rise, the handpiece can be used without water. 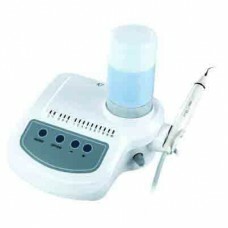 (3) LED curing light is available with some units—much more convenient to assemble and operate than conventional curing lights, saving time, money, and space; the light simply attaches to the unit in place of the piezo-electric handpiece; perfect for sealant curing in the hygiene room as well as for restorative materials. (4) easy, convenient barrier protection—intraoral camera sheaths intimately fit many piezo-electric handpieces; barrier protection for the unit itself is provided by simply placing a sheet of plastic wrap loosely over the entire unit; with this in place, the operator can adjust the water and power setting and place the dental handpiece in its holder without contaminating the unit, which minimizes the use of surface disinfectant, which would add time following the procedure and risk damaging the unit. (5) the use of state-of-the-art technology helps to strengthen patient relations; communicating with patients and educating them about the advantages of the piezo-electric scaler is a practice builder; patients feel more comfortable throughout the procedure and confident that they are receiving the best possible care.